Enclosure selection for pump systems is often at the bottom of the list when it comes to addressing design or redesign. Yet choosing the wrong enclosure due to a lack of education could become a costly mistake down the road, especially if the specified enclosure fails. This type of failure can result in a lawsuit or the loss of a good customer. Making sure that enclosure choices are well thought out is always in a company’s best interest. When choosing enclosures, it is best to research all the available materials and current rating standards. Plus, users should consider the environment where the enclosure will be placed. Enclosures can be made from metallic or nonmetallic material, but the material must serve its function of protection for the life of the installation. Durability and longevity are key. There are three typical types of materials available: thermoset composites, metal and thermoplastics. Thermoset materials, such as a polyester resin combined with glass, create a unique composite fiberglass reinforced polyester (FRP) that is exceptionally durable and weather resistant. 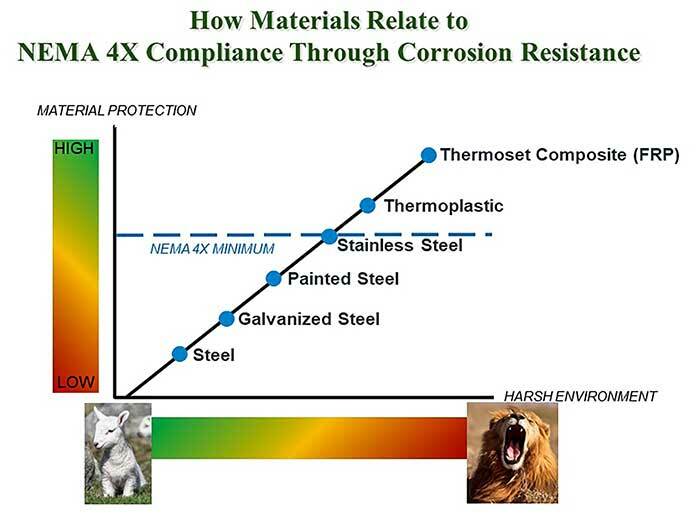 Like thermoplastics, FRP provides a greater degree of corrosion resistance than painted stainless steel, yet will perform better than metal and plastics in extremely harsh environments. Common metal enclosure choices included carbon steel, stainless steel and aluminum, with carbon steel being the most prominent choice based on its low initial cost. Carbon steel is typically galvanized or painted to prolong the service life. 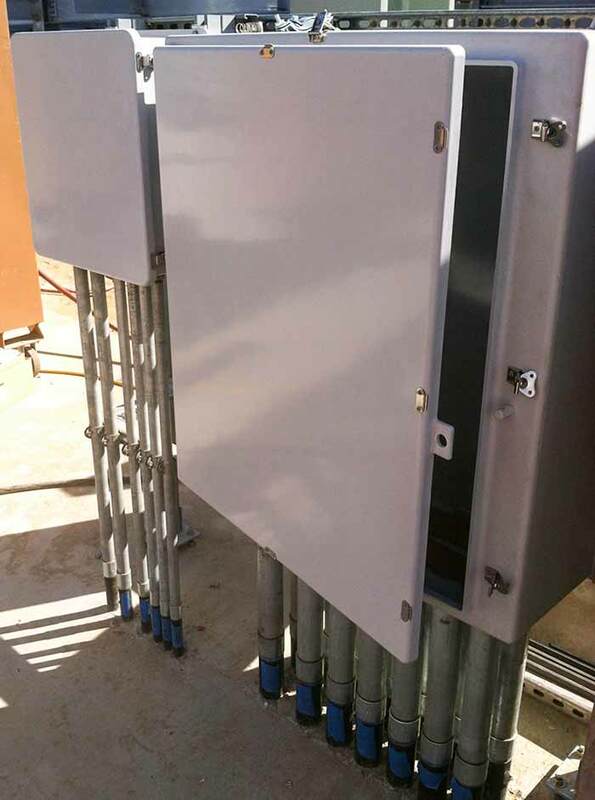 Premium metals such as stainless steel and aluminum are used where long life, corrosion resistance and weatherability are critical, such as protecting controls for junction boxes in applications. Thermoplastics—such as polycarbonate, polyester, acrylonitrile butadiene styrene (ABS) and polyvinyl chloride (PVC)—offer a degree of corrosion protection beyond painted carbon steel. Thermoplastics are more susceptible to ultraviolet (UV) exposure and weathering degradation over time. Certain stabilizers are now added to extend the life of the enclosure, but ultimately, the nature of the thermoplastics will yield to extended weathering. Image 2. Users should consider materials, rating standards and environment when choosing an enclosure.